Maxie Heating & Cooling is proud to serve the Monroeville community! Please call us today at 856-423-1400 to consult with our home comfort specialist. About Monroeville, NJ - Happy to be your hometown Heating & Air Conditioning Contractor! The town of Monroeville is located in the New Jersey counties of Gloucester and Salem, approximately thirty miles south of the city of Philadelphia. Largely rural in area, the town is home to approximately 4,500 residents and comprised primarily of farms and woodland areas. Monroeville’s location within the humid subtropical climate zone provides for a seasonal climate that produces long hot summers, cold snowy winters, and beautiful weather in spring and fall. Monroeville’s pastoral setting provides for a wealth of opportunity for outdoor recreation and leisure! Popular with residents and visitors alike is nearby Lake Garrison, featuring swimming, boating, camping, and fishing in a family-friendly environment. 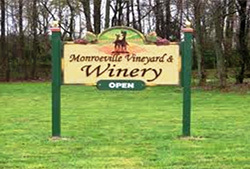 Other area attractions include the Monroeville Vineyard and Winery, McCann Family Farm, and Old Cedar Campground, with amenities that include a swimming pool, fishing lake, miniature golf, hayrides, and year-round special events. Monroeville is known far and wide for its bi-annual Camp Jam in the Pines, a three-day camping extravaganza that celebrates the musical styles of bluegrass, country, blues, and Americana with live bands, dancing, and more each spring and fall. Monroeville’s safe neighborhoods, excellent schools, and community-minded citizens make it a great place to live and raise a family in southern New Jersey!